So, instead of working on an album, I’ve been working on our 1st video guitar course called Guitar Yoga. It was a lot of work but the two of us are really proud of this course. Level 1 is ready and published. 94 full HD videos with short, to-the-point explanations and lots of practice play-along videos. It’s truly a learning-by-doing course that covers an important, but often neglected topic: warming-up. Once you’ve worked through the individual exercises, take a shot at the 12+ minutes final work-out that will get you fully warmed-up and ready to tackle whatever you wish to work on. Pretty rad, don’t you think? I especially love those synchronized finger movements in the final scene on the beach. The moral of the story is that it’s ok to change plans. I will record my own album, at some point. Maybe I’ll even be able to catch-up during the summer months when I don’t teach as many students. 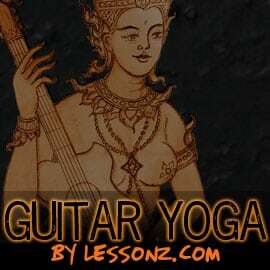 For now, check out the new lessonz.com site, join the free community and make sure to get the Guitar Yoga course.